The Karate Kid, John Avildson’s 1984 masterpiece about overcoming adversity and learning to kowtow to ancient Asian authority, taught me a few things about filmmaking. First is the ability of a great score (in this case by Bill Conti) and other music to heighten emotion in a film. The second is that I am a complete sucker when it comes to a sports underdog story. I knew at the time that I was watching a teenage retred of Rocky. That thought stayed in the back of my mind and was eventually shouted down by Conti’s score, Avildson’s slow build to the climax, and the power of the Crane Kick. Maybe it was due to my age, but The Karate Kid streaked past Rocky to live in a place all its own. The news of a remake, therefore, sent a chill through the last vestiges of my 12 year-old fanboy heart. The new film seemed like the brain child of a studio accountant and a Hollywood star (read: Will Smith) with enough stroke to not only get his own, hair-brained projects made (read: Oldboy remake) but to get them made as vehicles for his son, too. In other words, a movie designed to has mass appeal simply for the name, but that would be likely loved by only the aforementioned bean counter, triple threat, and his starring spawn. I was wrong. Well, not wholly, but mostly so. 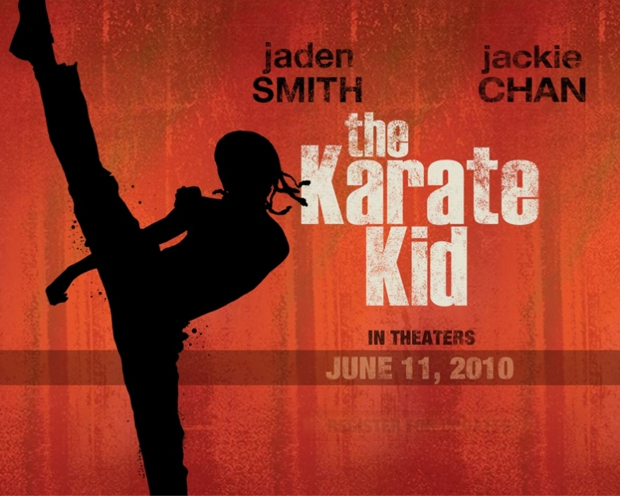 Harald Zwart‘s 2010 The Karate Kid isn’t exactly a revelation, nor even really an improvement on the original. It does, however, hit all of the notes you would expect, as well as adding a few things to the mix. The first is Jackie Chan. It’s good to see somebody with this long a career landing roles which don’t require him to put his life on the line doing his own stunts. Which isn’t to say that Jackie isn’t fighting here: he is, though I will admit that the beats that used to thrill in Hong Kong choreography are starting to wear thin for me. That being said, having a lifetime practitioner of martial arts in the role of a martial arts master is an upgrade from the much-beloved Pat Morita’s Mr. Miyagi. Jackie may not be quite the actor that Pat was, but the addition of a fight scene that features Mr. Han, the soon-to-be-shifu, actually fighting is a very welcome addition. Another upgrade places this version of the story in China. Not only does the up the ante when it comes to alienation for our main character, Dre Parker, but it offers some incredibly beautiful scenery and actual Asian backdrops and temples which are sorely missing from the original movie. While this does have the minor cost of enduring a few dreadful lines where characters discuss the merits of China and its wondrous sights ($5 million of the production budget was fronted by China Film Group, a Chinese government-run film company), the gorgeous shots of Dre and Mr. Han on Wudang Mountain are worth that small price. The actor playing Dre, Jaden Smith, is something of a mixed bag. He handles the more physical parts of the role with aplomb. There is also a reality in the tense relationship between he and his mother, Sherri Parker played by Taraji P. Henson. The decision to turn the tale from something more teenaged, with all of the accompanying physical changes and angst, to something more tween-friendly lends some real disadvantages. Chief among them, the need to find age-appropriate actors for the roles. The young Smith is clearly game, and is just as clearly a fan of his father’s work. If you have ever found a Will Smith acting habit annoying in any form, seeing his son’s adolescent version of each of dad’s favorite facial expressions will only crystallize that annoyance. The more emotionally dense scenes are a bit beyond his reach, but this is the natural result of placing a 12 year-old in a story which demands a broad range. Which isn’t to say Smith doesn’t show some promise. One hopes that he will find a healthy skepticism about his dad’s acting ability and some expanded mentoring to help him develop his chops. We will, given the box office returns and the dearth of young stars, be seeing much more of him in the future. Our hero Dre certainly does find himself in quite a bit worse a spot than Ralph Macchio‘s Daniel Larusso ever did. Not just uprooted, but plopped into a culture and language he doesn’t understand, then bullied by the local kung fu toughs to the point where he can’t even eat at school, poor Dre certainly does have the deck stacked against him. That the character decides to take the stoic, manly road is one of a list of changes that makes the violent confrontation of the kung fu tournament at the end pay off even more. Another payoff is James Horner‘s score. Never-say-die, against-all-odds sports stories are the perfect stage for grand, emotionally compelling music, and Horner approaches the brilliance of Conti’s work in the original movie. Having the added benefit of gorgeous vistas during the training sequences, as well as visits to the Forbidden City and Great Wall, certainly helps his cause. I love film scores, but rarely buy them. I bought several tracks here, and considered buying the album but decided against it for fear that it might contain the end credits rap by Jaden Smith and Justin (squee!) Bieber, the mere possession of which could cripple my considerable street cred.